We’re figuring out and implementing more efficient ways of doing the dirtier trailer chores (read: emptying and cleaning the black water tank). It’s a foul job that Luke has taken upon himself to perfect and turn into a seemingly painless process. Thank God. Code brown diapers were always my responsibility, so I’m incredibly pleased to find out that this job was not on my list of tasks. I’d like to say we’ll be even in this dirty job at the end of our travels but, I think Luke wins in this area… Emptying the black water tank once or twice a week definitely takes more courage and can-do attitude than changing poopy diapers for six years. We’re purging even more personal items than we did when we moved from our house to a space just over half the size of our single car garage. With a finished basement, our house gave us 2400 square feet of living space, and we’re living in 200 square feet now. We downsized by 92%… That’s the first time I’ve ever calculated it, and it seems completely insane. The numbers seem deceiving, the numbers make it seem like it’s a much bigger change than it actually was. It didn’t feel like a 92% change… It felt much, much less than that. However, I had a lot of discontentment within my responsibilities as a homemaker, so having only 200 square feet to keep tidy is a massive blessing to me. I’m dealing with the emotions of leaving Brooklin for this short time and trying to figure out my own tasks in this new trailer. We’ve temporarily moved into a bedroom in my mother-in-law’s cottage and it feels odd because we have our whole house in her driveway. It’s been a heart-stirring time for me, trying to maintain our presence in the trailer, but also live in the cottage… On our first night in the cottage, I kept feeling the structure move, just like in the trailer—like when you’re on a cruise, then come home and your expecting the house to bob around like the cruise ship. It made me homesick, even though the unsteady trailer had only been our home for five days, which led to an influx of emotions for me. I didn’t feel comfortable in this bedroom space that was so graciously offered to us, I felt like I didn’t belong—which is an extremely odd emotion to feel since we won’t be belonging anywhere for the next few years. I started to wonder if this feeling of not belonging is what it means to know, in my heart, that my citizenship is in heaven and not this world… Maybe it was something God was trying to teach me about this life, that I’m here for a short while, as an ambassador for heaven—Never too comfortable because I know a glimpse of the glory that awaits me. 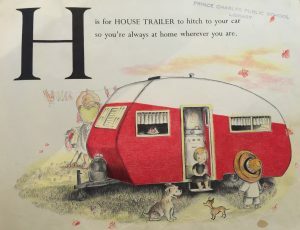 H is for HOUSE TRAILER to hitch to your car so you’re always at home wherever you are. It felt like God gave me these words to comfort me and encourage me. I realized this was exactly how I had been feeling, with my discomfort from living outside of our trailer and in a stationary house… I feel at home in my house trailer, and wherever we are, we are home.